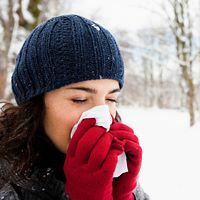 Home › Blog › Why does my nose run when I run in cold weather? "Our noses warm and humidify — add moisture to — the air we breathe as it travels down into the lungs. So when you inhale cold, dry air, the moist tissue inside the nose automatically increases fluid production to do its job of protecting sensitive lung tissue. But when there's too much fluid, the excess tends to drip out, creating a runny nose. Winter has other effects that make it more likely you’ll have a runny nose. Cold temperatures can cause the small water droplets inside the moist nose to join together, forming big, heavy drops of water that can also drip from your nostrils. And cold air also speeds up mucus production." Now, when your kids ask you that question, you can maintain your image as an all-knowing parent. It's too late for me.